What Makes a Good Concrete Saw? A concrete saw is a saw that is used to cut masonry and concrete. Cutting through these dense materials requires a special saw with a blade that is designed specifically for this application. You should never use a blade designed to cut wood or a regular chainsaw for cutting concrete. The Husqvarna K 760 is a well-designed and popular tool. This compact machine is powerful and lightweight and is the perfect choice for commercial construction such as cutting door and window openings into concrete buildings, and for cutting concrete and stone for walkways, buildings and other applications. 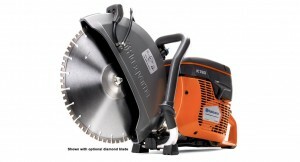 The improvements made on the Husqvarna K 760 have improved the saw’s efficiency and customer satisfaction. Starts are 50% easier with this unit and are part of its appeal. 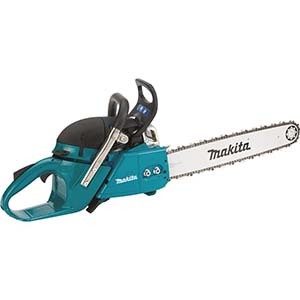 The easier starts on this saw are due to the unique design of the carburetor, cylinder and digital ignition system. In addition, the air purge and decompression value are also part of what makes this saw easy to start so that you can quickly get going on your project. Vibrations can be a problem with saws of this nature, but not with the Husqvarna K 760. Vibrations are below 2.5m/s2 in the handles where a lot of the vibration usually occurs, so using this concrete saw is much more comfortable than other models. Because of the reduced vibrations, this concrete saw can be used for much longer intervals than its competition. This machine will not need to be serviced as often as other machines thanks to the strong Poly-V belt combined with the maintenance-free starter DuraStarter™ and the Active Air Filtration™. Being able to use this saw for longer intervals means less down time and less money spent on maintenance and repairs. It doesn’t mean that maintenance will never be required, but you will experience longer periods of time between service visits. Durability is also increased because of SmartCarb ™ a built-in automatic filter system that maintains the high power that users look for and lowers fuel consumption too. Along with DuraStarter ™ this includes a starter cord as well. All of these features combined make for a concrete saw that is almost maintenance free. 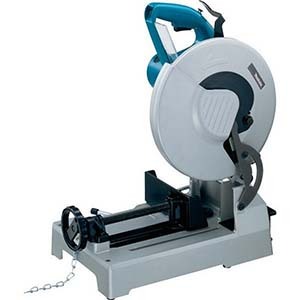 This concrete saw is the type of saw most often used in commercial applications. 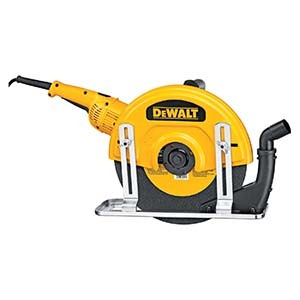 This saw can handle jobs such as designing gardens and concrete pathways, masonry work, minor asphalt work, gas, water and sewer maintenance, pile cutting, working with concrete and stone, cutting windows and doors in concrete buildings and homes, and other similar tasks. This power tool is best for contractors, landscapers, construction workers, asphalt layers and others in similar professions. They may cost a little more, but when you do this kind of work on a regular basis, it is an investment that is well worth it. There are several features that make up this excellent concrete saw. These improvements and upgrades have all come together to make a concrete saw that is flexible and less strenuous than models of the past. The light-weight magnesium blade-guard makes cutting a lot easier. 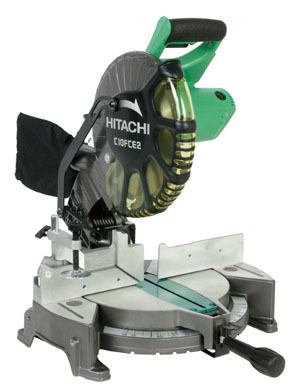 It’s easy to change the cutting position with the step-less adjustment process that this concrete saw uses. Another benefit to the new blade guard is that it reduces vibrations which help improve hand and arm fatigue. When stone and concrete are being cut, dust is usually a major problem. The new tank ventilation system that the Husqvarna K 760 utilizes provides excellent air supply to the fuel tank and prevents dust from entering the tank. Since dust in the tank can cause problems, preventing it from gettin in makes the saw more reliable in operation and gives you longer times between servicing. Using water to cut stone is one way that this machine makes dust control more manageable. It also keeps the work from getting too hot. The progressive water value allows the user to control the water volume. This adjustability means less water usage and slurry. Emissions can be a problem with certain power tools. The newly-designed cylinder that the Husqvarna offers provides more efficient combustion. When this is combined with additional cooling fins, the result is 15% less emissions. In addition, the changes in climate or fuel don’t result in over sensitivity of the saw. Another popular feature is the reversible cutting arm which means you can cut right or left. This allows the user to be able to cut closer to the ground or walls if space is a little bit of an issue. The fully sealed drive belt transmission is another feature you want to look for and already have with the Husqvarna K760. By having the fully sealed transmission, users will not have to worry about keeping the dust from ruining the machine and cutting its life short. The other thing this fully sealed transmission does is reduce the wear and tear that the concrete saw can receive. Fuel indicators are always convenient so you don’t have to guess or try and figure out how much gas you have left. The fuel indicator shows the fuel level so users won’t accidentally run out of gas. The research process we went through when looking at concrete saws was very detailed. We started by doing a general search on concrete saws to see what we found. These general searches gave us the features that one should look for in the top concrete saws on the market. Features we found included fewer emissions, improved dust control, less vibrations and other productivity improvements. Next we talked to professionals and experts who used concrete saws on a regular basis and would be familiar with what made up the best concrete saw. We also utilized tool blogs and magazines. 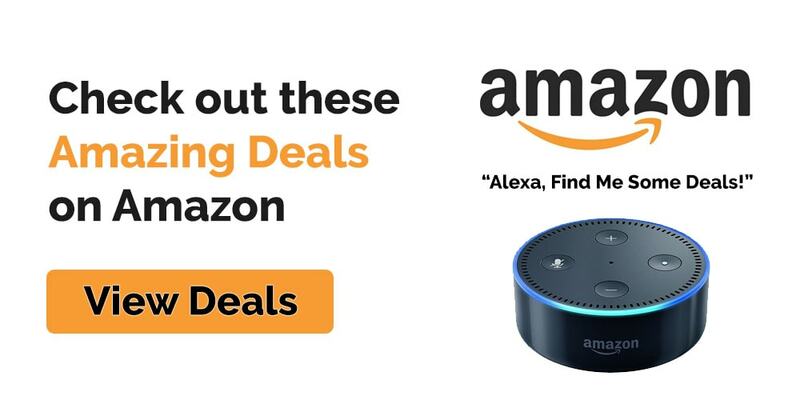 We rounded out our research with customer feedback and comments from various sites and also from Amazon and came up with the best of the best in concrete saws. The Husqvarna Concrete saw is perfect for many different jobs in the construction industry. A few of these jobs include concrete cutting, pile cutting, masonry work, working on and repairing gas, water and sewer lines, doing landscape work, building new houses and businesses and asphalt work as well. The engine has what is called X-Torq which provides more power than the usual concrete saw and higher torque. It also lowers fuel consumption by 20% and has a whopping 75% fewer emissions than some of the other concrete saws. The advanced anti-vibration system that is has reduces vibrations in the handles of the saw which makes them much more comfortable to hold. This means the user can handle using it for much longer periods of time and that means more productivity. The distance between the handles is larger; giving the concrete saw a more comfortable operation position for the arms and hands. This reduces the strain. The design of the Husqvarna, long handles and a short engine body, means that when using it the operator stands close to the saw. This makes it much easier to control and handle. The Husqvarna K 760 has one of the most efficient designs on the market for the air filtration system. It is one of the only concrete saws that can say they deliver operational times on dry cutting there is. During this time, which is about one year, no service is necessary on the filter. There are many models, including this one that has that has a Poly-V-Belt that extends the product life, extends the time between necessary service times, and provides a much better transmission of power. It’s also 25% less noisy because of a large muffler. If you are looking to upgrade to an even higher level concrete saw, what you’re looking for is the MK Diamond 159345 MK-CX-3 H. Versatile with both wet and dry cutting, the lightweight concrete saw enables the user to get ONE saw for both types and not one or the other. This concrete saw has a built in water distribution system that works to supply both sides of the cutting blade, keeping dust down and preventing it from becoming too hot. Other features include an adjustable depth control, throttle control on the console and the ability to cut left or right. The aluminum frame construction lasts a long time and is very durable. Another benefit to the MK CX-3 is that is has a folding handle bar for easy transport, and the hinged blade guard provides easy access for inspections and any blade changes that need to be done. The cast aluminum blade guard is corrosion resistant too. It is important to care for your concrete saw properly so it lasts a long time. When you keep up with maintenance and follow the service schedule it ensures that the machine stays running properly. The same thing applies to using it safely and adhering to the safety precautions that are in the user’s manual. We have provided the following tips for you regarding care and maintenance for your Husqvarna K760 concrete saw. Always wear approved safety gear when operating the concrete saw such as goggles, breathing mask, non-slip grip gloves, protective hard hat, steel toe shoes and tight-fitting clothes. Never use a broken or improperly acting concrete saw. If something seems wrong or off, check it out before using it. Don’t use the concrete saw in bad weather including dense fog, heavy rain, strong wind, intense cold, etc. Always work in a sufficiently lit area to ensure that user can see clearly and avoid any potential problems or accidents. Make sure that no pipes or electrical cables are in the way of the working area or in the materials that are being cut. Don’t move the machine when the concrete saw is running and the blade is rotating. Stay a safe distance away from the cutting blade when the saw is running. Only use abrasive or diamond blades in the concrete saw. The concrete saw is more often used in professional and industrial settings but it is still a widely used and commonly purchased saw that many people have a regular use for. With so many people running their own construction or landscaping businesses these days, having a concrete saw can be a boost to that business in the capabilities it gives you in the way of jobs. 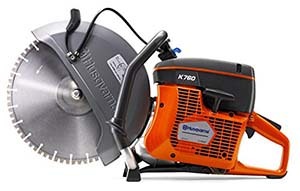 With all of the improvements that have been added to the Husqvarna K 760, it is no wonder it is so popular and preferred above most other concrete saws. Although it is not small and compact, it is portable and can be moved from job site to job site as needed. It is a great saw to get if you do a lot of stone and masonry work or have your own construction, landscaping or building business.